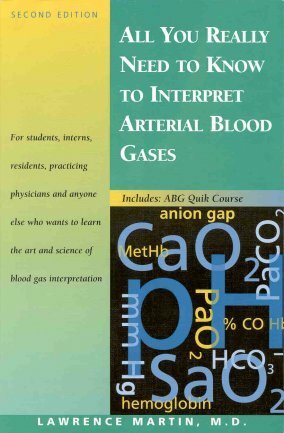 The following section is adapted from Chapter 8 of All You Really Need to Know to Interpret Arterial Blood Gases, 2nd edition. Does the patient have a mixed acid-base disorder? There is perhaps no more confusing topic related to blood gases than mixed acid-base disorders. This topic has already been discussed in Chapter 7 in regards to the serum electrolytes. As was pointed out, calculation of the anion and bicarbonate gaps can help uncover mixed metabolic disorders (e.g., anion gap metabolic acidosis and metabolic alkalosis). Of course, to accurately diagnose the specific disorders and their relative severity at least one set of blood gases is usually necessary. When there is significant deviation from the expected changes for a single disorder, a mixed disorder is usually present. I have found the following four "tips" especially helpful in diagnosing mixed acid-base disorders. Single acid-base disorders do not lead to normal blood pH. Although pH can end up in the normal range (7.35 - 7.45) with single disorders of a mild degree, a truly normal pH with distinctly abnormal HCO3- and PaCO2 invariably suggests two or more primary disorders. Example: pH 7.40, PaCO2 20 mm Hg, HCO3- 12 mEq/L, in a patient with sepsis. This patient's normal pH resulted from two co-existing and unstable acid-base disorders: acute respiratory alkalosis and metabolic acidosis. Simplified rules predict the pH and HCO3- for a given change in PaCO2. If the pH or HCO3- is higher or lower than expected for the change in PaCO2, the patient probably has a metabolic acid-base disorder as well. The rules in Table 8-3 show the expected changes in pH and HCO3- (in mEq/L) for a 10 mm Hg change in PaCO2 from either primary hypoventilation (respiratory acidosis) or primary hyperventilation (respiratory alkalosis). CO2 + H2O <------> H2CO3 <------> H+ + HCO3-. b)	A normal or slightly elevated HCO3- in the presence of hypocapnia suggests a concomitant metabolic alkalosis, e.g., pH 7.56, PaCO2 30 mm Hg, HCO3- 26 mEq/L. In contrast, the compensation for metabolic alkalosis (by increasing PaCO2) is highly variable, and in some cases there may be no or minimal compensation. For each of the following sets of arterial blood gas values, what is (are) the likely acid-base disorder(s)? In a), the bicarbonate is lower than expected for acute hypo-ventilation; the patient has respiratory acidosis and metabolic acidosis. In b), bicarbonate is higher than expected for acute hyperventilation; the patient has respiratory alkalosis and metabolic alkalosis. In c), PaCO2 is higher than expected for fully compensated metabolic acidosis, suggesting a concomitant respiratory disorder or very early metabolic acidosis. Always keep in mind that any isolated measurement of pH and PaCO2 can be explained by two or more co-existing acid-base disorders. Thus, even when blood gas values fall into one of the 95% confidence bands, the patient may still have a mixed disorder. Often, the only way to know for sure is by detailed analysis of all the clinical and laboratory information and close patient follow up. His pH and PaCO2 fit into the band of acute respiratory alkalosis. He has moderate hypoxemia and the blood gas data alone could be explained by acute hyperventilation due to pneumonia. But the anion gap is elevated at 26 mEq/L, indicating a concomitant metabolic acidosis. The delta anion gap is 14 mEq/L, giving an expected serum CO2 of 13 mEq/L, and a bicarbonate gap +8 mEq/L. Thus the patient manifests three separate acid-base disorders: respiratory alkalosis (from pneumonia); metabolic acidosis (from renal disease); and hypokalemic metabolic alkalosis (from excessive diuretic therapy). The result of all this acid-base abnormality? Blood gas values that are indistinguishable from those of simple acute respiratory alkalosis. Each primary acid-base disorder should be viewed as a physiologic process caused by a specific clinical condition or disease, not simply as changes in blood gas and electrolyte values. This view allows for unraveling complex or mixed acid-base disorders. Points to remember for proper acid-base diagnosis and management can be summarized as follows (Figure 8-3). Determine existence of acid-base disorder from arterial blood gas and/or serum electrolyte measurements. For electrolytes, follow steps outlined in Figure 7-2. Check serum CO2 for abnormal value. Calculate AG and, if elevated, calculate the bicarbonate gap. If the measured pH and/or PaCO2 are abnormal, you should be able to discern at least one primary acid-base disorder from the observed changes (Table 8-1). The changes for each primary disorder are straightforward and should be committed to memory. Use a full clinical assessment (history, physical exam, other lab data including previous arterial blood gases and serum electrolytes) to explain each acid-base disorder (Table 8-1). Remember that co-existing clinical conditions may lead to opposing acid-disorders, so that pH can be high when there is an obvious acidosis, or low when there is an obvious alkalosis. Treat the underlying clinical condition(s); this will usually suffice to correct most acid-base disorders. If there is concern that acidemia or alkalemia is life-threatening, aim toward correcting pH into the range of 7.30-7.52 ([H+] 50-30 nM/L). Clinical judgment should always apply. See Pitfalls 12-14 in Chapter 13. Clinical Problem 8-3. A 45-year-old man comes to hospital complaining of dyspnea for three days. Arterial blood gas reveals pH 7.35, PaCO2 60 mm Hg, PaO2 57 mm Hg, HCO3- 31 mEq/L. How would you characterize his acid-base status? He is found to have congestive heart failure and is treated with supplemental oxygen and diuretics. Three days later he is clinically improved, with pH 7.38, PaCO2 60 mm Hg, HCO3- 34 mEq/L, and PaO2 73 mm Hg (on FIO2 24%). How would you characterize his acid-base status now? Clinical Problem 8-5. The following values are found in a 65-year-old patient. Which of the following most closely describes this patient's acid-base status? Based on this information, how would you assess her acid-base status? Clinical Problem 8-7. An 18-year-old college student is admitted to the ICU for an acute asthma attack, after not responding to treatment received in the emergency department. ABG values (on room air) show: pH 7.46, PaCO2 25 mm Hg, HCO3- 17 mEq/L, PaO2 55 mm Hg, SaO2 87%. Her peak expiratory flow rate is 95 L/min (25% of predicted value). Asthma medication is continued. Two hours later she becomes more tired and peak flow is < 60 L/minute. Blood gas values (on 40% oxygen) now show: pH 7.20, PaCO2 52 mm Hg, HCO3- 20 mEq/L, PaO2 65 mm Hg. At this point intubation and mechanical ventilation are considered. What is her acid-base status? Assuming his anion gap is elevated at 23 mEq/L, how would you described the acid-base changes? Clinical Problem 8-9. In review, state whether each of the following statements is true or false. a)	Metabolic acidosis is always present when the measured serum CO2 changes acutely from 24 to 21 mEq/L. b)	In acute respiratory acidosis, bicarbonate initially rises because of the reaction of CO2 with water and the resultant formation of H2CO3. c)	If pH and PaCO2 are both above normal, the calculated bicarbonate must also be above normal. d)	An abnormal serum CO2 value always indicates an acid-base disorder of some type. e)	The compensation for chronic elevation of PaCO2 is renal excretion of bicarbonate. f)	A normal pH with abnormal HCO3- or PaCO2 suggests the presence of two or more acid-base disorders. g)	A normal serum CO2 value indicates there is no acid-base disorder. h)	Normal arterial blood gas values rule out the presence of an acid-base disorder.